Snow plowing is a necessary service in the winter months when the snow falls thick and it becomes difficult to get out of your home or commercial property. While some property owners do handle snow removal themselves it becomes almost impossible to keep up with this task when there is consistent snowfall over an extended period of time. This makes it necessary to hire the services of expert snow plowing and snow removal experts. We at AK Lawn Care are a front-running snow removal contractor based in Milan, MI and cater to customers in and around Ann Arbor, Belleville, Chelsea, and Canton. We also cater to customers across Chelsea, Dexter, Dundee, and Plymouth. Over the years, we have also created a very strong customer base across Saline, Tecumseh, Ypsilanti and the surrounding areas. While we use a variety of equipment and tools in our work, snow plows are ideal for clearing snow from all types of properties, both big and small. 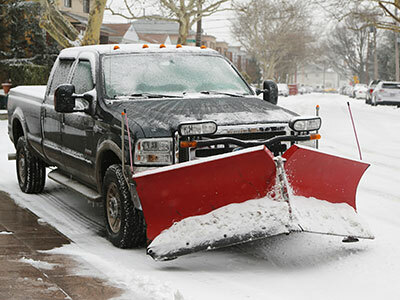 One of the commonly-used snow plowing equipment is the plow truck and we have a number of these to carryout snow clearing on our client’s properties. These large dump trucks are outfitted with massive snow blades on the front and they may also have salt spreaders affixed to the rear. Residential Snow Clearing - When straight plowing equipment is being used on residential properties, the passes are made away from the structures and towards the perimeter of the property. Our operators ensure that the blade isn't angled towards the building because the objective is to ensure that the snow stays as far from the structures as possible. Commercial Snow Removal - V-plows are used to make the initial breakthrough. The shape of these plowing machines is effective in removing deep drifts, ice, and hard-packed snow. The blade may be set either in an angled/ straight position when the operators are carrying out stacking, wide-path plowing or general plowing. When snow has to be cleared and carried away from the site, a scooping blade movement is used. Industrial Snow Plowing - Containment/box/pusher plows are ideal for clearing snow from large industrial properties. When our operators are using snow pushers they ensure these are attached to the trucks as per the manufacturer specifications. When snow pushers are attached to a compact utility tractor, a backhoe, loader or even a skid-steer loader, the operators are able to move very large volumes of snow efficiently and quickly. Our experienced pushers use the right techniques while handling any snow removal job making sure that none of the features on your industrial property are damaged in any way. We provide excellent 24/7 emergency snow plowing services to residential, commercial as well as industrial customers. At AK Lawn Care, we handle every aspect of your job from start to finish. Call us at 734-439-3063 and speak with our experts about your requirement. You can also send us the specifics of your project via the Contact Us form on this page and we will revert shortly.